The National Transport Company has a number of large trucks. One of the trucks is in poor condition and needs an immediate renovation at a cost of $100,000. An overhaul of engine will also be needed 6-years from now at a cost of $10,000. 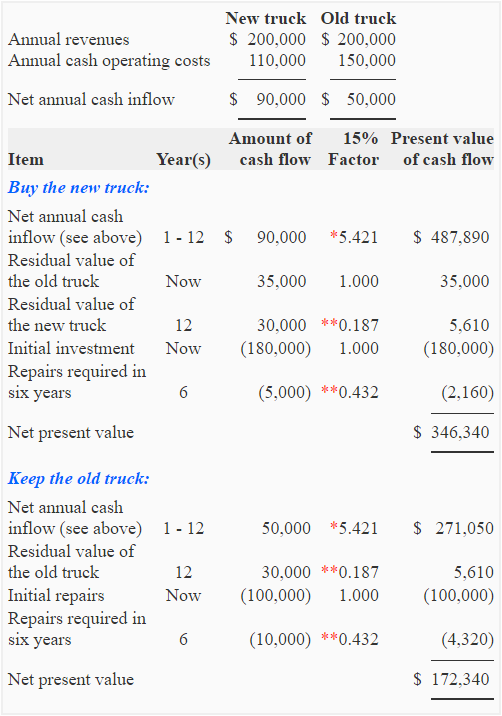 If theses costs are incurred, the truck will be useful for 12 years. After 12-year period, it will be sold at a salvage value (scrap value) of $30,000. At this time, the salvage value of the truck is $35,000. The total annual revenues of the truck will be $200,000 and the total cost to operate the truck will be $150,000 per year. Alternatively, National Transport Company can purchase a new truck for $180,000. The new truck will require some repairs at the end of 6-year period at a cost of $5,000. Its salvage value will be $30,000 after its useful life of 12 years. The total annual revenues of the new truck will be $200,000 and its operating cost will be $110,000 per year. The company’s required rate of return is 15% before taxes. 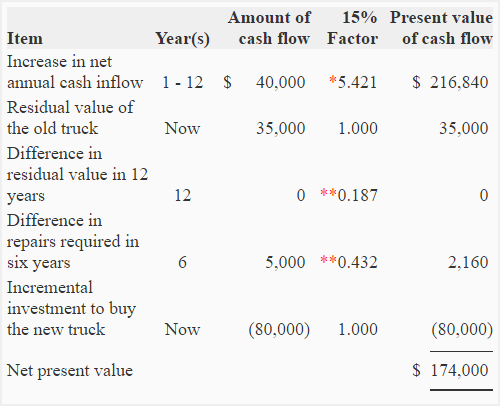 Since the NPV of new truck surpasses the NPV of old truck by $174,000, the company should buy the new truck rather than renovating the old one.